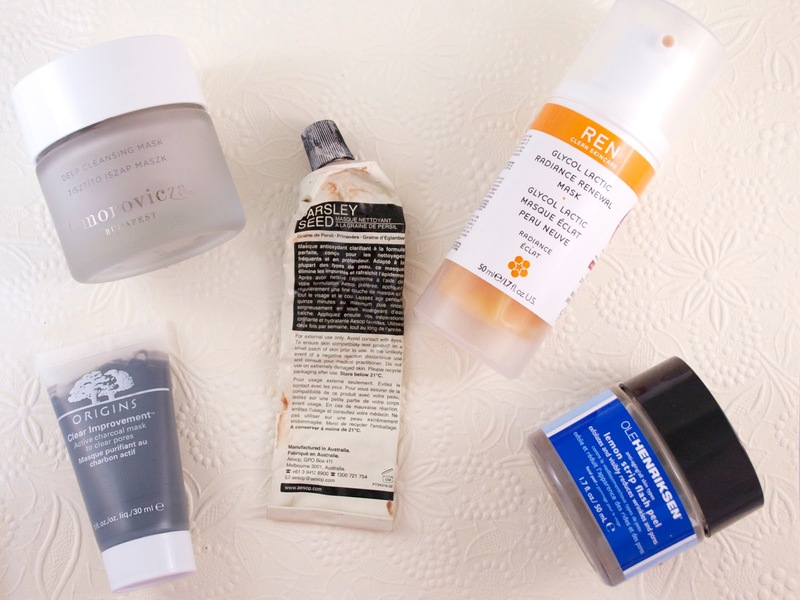 Jules Darling: Skincare Saviors: My Favorite Masks! Skincare Saviors: My Favorite Masks! I'm a big fan of facemasks--a bit of a junky, if you will. And while skincare is incredibly individualized, I thought I would share with you my current favorites in case you are on the hunt for a new mask. Keep in mind that my skin is not at all sensitive, but it is very oily and I'm quite prone to clogged pores and congestion. I also sometimes have trouble with hormonal acne around my chin--and recently on my cheeks, as well. There are really two categories of face masks that I look for: those that will give a deep clean and those that are exfoliating. The desire for deep cleaning is pretty self-explanatory, but I find that exfoliating masks (and exfoliating skin-care in general) offer two benefits: many of them have anti-aging properties and they also remove the dead skin that triggers a lot of my clogged pores. REN Glycol Lactic Radiance Renewal Mask: I've spoken of my love for this mask before (at last count, it has made it into three of my monthly favorites lists and in one other 'best of' skincare post! ), but I had to include it as any list without this would feel incomplete. Using acids to exfoliate the skin, I find that this helps improve the texture and tone of my skin without feeling overly harsh. It looks and smells like marmalade, and it doesn't burn or have a harsh tingling effect like some others can do. My favorite thing to do is apply this and leave it on for around 30 minutes and then follow up with a deep cleansing mask. I feel that using this to get rid of the dead skin first allows other masks to work more effectively. Available at Sephora for $55. Aesop Parsley Seed Mask: This is a clay-based mask meant to smooth and refresh skin, particularly skin that is sensitive or dry. Even though my skin is neither of those things, this mask is a real workhorse. It goes on in a thin layer and is almost skin-colored. It gets a little tight as it dries, but it isn't majorly painful or uncomfortable. As you can see by the picture, this has been a well-loved and much-used mask. I bought it at the same time as the Aesop Chamomile Anti-Blemish mask, but I actually find that this does more to soothe any current outbreaks (and prevent future ones). I probably have 1 or 2 more uses of this mask. Once it is done, I will definitely be repurchasing it, along with some other products from the Aesop Parsley Seed Line. Available at Barney's for $39. Omorovicza Deep Cleansing Mask: Omorovicza is a luxury brand from Hungary that has begun to gain popularity in Europe and the U.S. It is fairly on the pricey side, but if you are savvy in your online shopping, you can often save a bit on items from this brand. For example, the Deep Cleansing Mask is $120 for 50mL at Sephora. But earlier this year, Cultbeauty.co.uk offered a set that contained the Deep Cleansing Mask and the Thermal Cleansing Balm (both 50mL) for around £68 (which is roughly around $115 depending on the exchange rate). So, I got these two products, which would have cost $225 at Sephora for around $115. I realize that is still pricey, but my point is that if you shop around and wait for sales, these can be much more affordable. Anyways, on to the mask itself: this is a mud and clay mask that draws out impurities. You only need a tiny amount each time, so the pot will last you for ages. It feels divine on the skin--cooling and soothing. I swear that it even helps hydrate my skin while I have it on! To me, this is everything that the Glamglow Supermud Mask wants to be. Without fail, I can see a noticeable difference in the clarity of my skin after I use it. Available at Cult Beauty for £57 (around $95). Olé Henriksen Lemon Strip Flash Peel: This mask is like a much amplified version of the REN Glycol Lactic Radiance Renewal Mask mentioned above. It uses glycolic and lactic acids to resurface the skin and has algae extract to soothe and nourish the skin. The algae is necessary because this mask definitely tingles when you apply it. Since I have quite robust skin, I don't find this particularly troubling, but if you are more sensitive you might want to do a patch test or work on building up your tolerance. I use this rather than the REN when my skin is in bad shape and I always make sure to use a soothing and reparative serum afterwords. It really works on my skin, though, which is worth a little discomfort. One thing to note is that this comes with a brush to apply it, but I highly, highly recommend you skip using this brush as it is the most scratchy and uncomfortable thing in history. You're better off using your fingers or an old paddle foundation brush. Available at Dermstore for $48. Origins Clear Improvement Active Charcoal Mask: This mask is a cult favorite amongst beauty bloggers, and for good reason. It is cheap and effective, without being too harsh. I prefer the Omorovicza and the Aesop masks to this one, but for a great budget alternative that will really draw out impurities from your skin, this is a great one! Available at Sephora for $17. Some honorable mentions go out to the Boscia Luminizing Black Mask and the Clinique Moisture Surge Overnight Mask. Both of these are fairly new additions for me, so I didn't feel I could include them here as I want to test them out a few more times. But initial impressions for both have been positive! What are your favorite face masks? I'm always on the hunt for new ones, so let me know below! And please follow me on Bloglovin, Instagram, and Twitter if you like!